These are my boys, my family. Once I used to wonder if I would ever have a family and here it is. It is truly amazing. It is the most wonderful feeling to love and be loved. Being a mum is hard work but I wouldn't change it for the world! Yesterday we made the most of the sunny weather and headed to London's Southbank. One of my favourite places in London. We went for lunch before strolling along the Thames, enjoying the sun and watching the street artists. Our route also took us past St Thomas' hospital where Eliot was born. We reminisced and attempted to work out which room on the 7th floor I'd delivered in. When it comes to views I'm sure this hospital has the best! Big Ben, the Thames and The Houses Of Parliament. 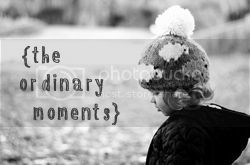 One of the best 'Ordinary Moments' is simply family time.